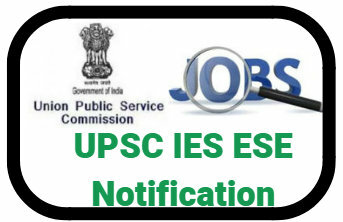 The Union Public Service Commission (UPSC) is to publish the official notification with reference to the Indian Engineering Service (IES)/Engineering Service Examination (ESE) – 2019 on its official website. The candidates who are waiting for the official notification should have to not wait some more time. The official notification of IES/ESE will be uploaded on 20th March 2019 the official website of UPSC. We will also notify you about the official notification only here. The Union Public Service Commission (UPSC), As according to the official calendar of 2019 examinations uploaded by UPSC, official notification for the Indian Engineering Service (IES)/Engineering Service Examination (ESE) – 2019 and the last date for submission of applications is 16th of April 2019 and the examinations of Indian Engineering Service (IES)/Engineering Service Examination (ESE) – 2019 will be commence from 28th June 2019 (3 Days Duration). These dates are tentative subject to change. The Union Public Service Commission (UPSC) which is also known as UPSC is empowered with the aim to conduct the Civil Services Examination, Indian Forest Service examination, Engineering Services Examination, Combined Defence Services Examination, National Defence Academy Examination, Naval Academy Examination, Combined Medical Services Examination, Special Class Railway Apprentice, Indian Economic Service/Indian Statistical Service Examination, Combined Geoscientist and Geologist Examination, and Central Armed Police Forces(Assistant Commandant) Examination. Aspirants from all over India in very huge numbers participate in these examinations. This year to it has issued the notification for the Indian Engineering Service (IES)/Engineering Service Examination (ESE) – 2019 examination. The examination was already conducted by the UPSC. Next year too it will be going to upload the official notification on its official website. But for the benefits of the candidates we are giving some expected information regarding educational eligibilities, age limits, part 1/part2 registration, examination pattern and etc. A candidate who want to apply for this examination must have attained the age of 21 years and must not have attained the age of 30 years on the 1st January, 2019 i.e. he/she must have been born not earlier than 2nd January, 1987 and not later than 1st January, 1996. Relaxations of upper age limit will be provided to the candidates as according to the norms. Wait for the official notification to read out these details. The candidate who want to apply for the examination and want to participate in the examination must have a degree in Engineering from a recognized University or Educational Institution established by an Act of Parliament. For more educational qualification wait for the official notification to be arrive on the official website. Candidates (excepting Female/SC/ST/ PH who are exempted from payment of fee) are required to pay a fee of Rs. 200/- (Rupees Two hundred only) either by depositing the money in any Branch of SBI by cash or by using net banking facility of State Bank of India/State Bank of Bikaner & Jaipur/State Bank of Hyderabad/State Bank of Mysore/State Bank of Patiala/State Bank of Travancore or by using Visa/Master Credit/Debit card. Candidates who want to apply for the IES/ESE have to visit to the official website. Before applying for the examination, candidates are advised to read the official notification carefully. Candidates should have valid E-Mail ID, Mobile Number, Scanned Copy of Photo and Signature which will be needed in further steps of registration. Search for the link of Part 1 registration for Indian Engineering Service (IES)/Engineering Service Examination (ESE) – 2019. Enter all the required details like personal details and educational information. Submit the part-1 registration form and preserve the registration id which will be required at the time of Part 2 registration. After submitting the part 1 registration form , download and save it in pdf format for future references. Click on the Part-2 Registration for Indian Engineering Service (IES)/Engineering Service Examination (ESE) – 2019. Upload you scanned copy of passport size recent photo and signature and submit these. Pay the fee by choosing your favored method “Pay by online” or “Pay by Cash”. Submit the Part-2 Registration and download and take a print of it for further uses. Part-I, The written Examination will comprise two sections- Section I consisting only of objective types of questions and Section II of conventional papers. Both Sections will cover the entire syllabus of the relevant engineering disciplines. The details of the written examination are given in the table below. The candidates who will qualify in the written examination will need to appear in the Part-II examination which is Personality test carry 200 marks. The eligible candidates shall be issued an e-Admission Certificate/E-Admit Card three weeks before the commencement of the examination. The E-Admit card will be made available on the official website of USC very shorty. No E-Admit Card will be sent by the post to any candidates in any circumstances. The candidates are informed that our wonderful team of www.edunewsportal.in will soon convey all the information related to the recruitment notifications of UPSC Indian Engineering Service (IES)/Engineering Service Examination (ESE) – 2019, their Examination Dates, Examination Patterns, answer keys, cut-off and result exclusively here. So stay in touch with us.